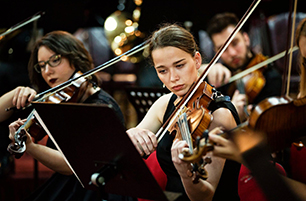 Concert season of Academy of Music of University of Sarajevo is a project continually organized and implemented by Academy of Music of University of Sarajevo. Concert season is related to the academic year, within which over 50 concerts and artistic events are organized, including concerts by students, professors, academic ensembles such as String orchestra, Symphony orchestra, Mixed and Women’s choir of Music Academy, “Etnoakademik” ensemble, and aMAS ensemble. 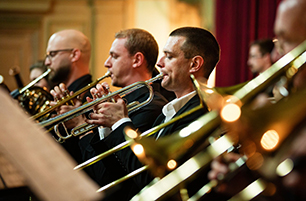 Through various forms of concerts (ensemble concerts, all-evening recitals, concerts of mixed character), all Academy departments are presented as well as their rich artistic and concert activity. Besides, Concert Season includes festivals May Music Festivities, Sonemus Fest, Sarajevo International Guitar Festival and Sarajevo Chamber Music Festival. The primary goal of the Concert Season is to provide a possibility for Music Academy students to present the knowledge acquired at the higher-education institution to the public, and thus practice public and on-stage performance, which is necessary for the professional involvement in art. Academy professors also regularly perform during the Season, which increases the significance of the Season as a unique mix of talent and necessary artistic experience. By organizing concerts in the Army Hall, Bosniak Institute Adil Zulfikarpašić, National Theatre in Sarajevo, Sarajevo Town Hall and other available spaces, Concert Season offer, to the public, a free-of-charge entrance to all concert events, aimed at educating broader public, and it also provides a unique musical experience, which is absolutely necessary in the context of promoting true artistic values among the BiH public. It should be noted that the target group of the Concert Season includes both professors and students, and a broad range of Bosnian and Herzegovinian public since the earliest childhood age. It is proven by the Academy's intention to organize cycles of concert entitled Academy for Kids within the concert season, the content of which is adjusted to children of pre-school and earliest school age. Wishing to promote the rosk of Music Academy and disseminate artistic values in all significant cultural centers of BiH Concert Season also organizes concert cycles Academy on Tour, which imply Academy students and professors' concerts in Zenica, Tuzla, Bihać, Banja Luka and Široki Brijeg. In this way, Academy is striving ti send a message, to BiH public, that Academy is a higher-education institution whose aim is to selflessly share the results of its artistic work, all aimed at promoting art in line with top-class aesthetic standards.